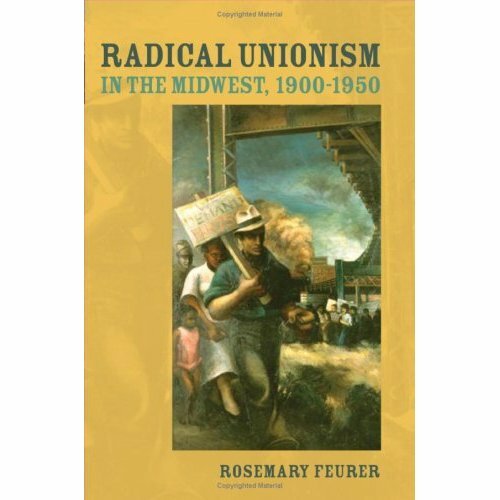 Rosemary Feurer, Radical Unionism in the Mid-West, 1900-1950 (Chicago: University of Illinois Press, 2006). Many of the working-class history monographs that have been published in recent years have been community-based studies that have striven to illustrate the origin and meaning of broad regional or national themes. This type of historiography has occasionally met with mixed success. Rosemary Feurer’s new book is unquestionably a successful effort to view the remarkable challenges faced by the American labour movement over a fifty year period through the lens of one mid-western community. Anyone who may question the efficacy of community based studies need look no further than this book to have their concerns dispelled. Feurer contends that the uneven nature of capitalist development led local terrain to be an important area of class struggle and movement formation. Her subsequent supporting evidence, which is firmly grounded in broad primary source research, ably supports this main thesis. Choosing to make District 8 of the United Electrical Workers the focus of her study is particularly significant. The UE was often viewed as being run by communists by other unions in both the Congress of Industrial Organizations and the American Federation of Labor. The UE, despite its importance in the history of the American labour movement, has not received the kind of attention that has been devoted to unions in auto and steel. District 8 was also based in the mid-west – an area that deserves more scrutiny from working- class historians. Feurer’s analysis of UE District 8 sheds light upon the internal operation of the union, and reveals internal tensions and rivalries that seem to have roiled virtually every American union in the 1930s and 1940s. The main conflict within the UE, as with many industrial unions, was over the role of communists. This book would be a major contribution to the existing body of work on industrial unions for its commentary on communism if for nothing else found between its covers. Like Stephen Meyer’s Stalin Over Wisconsin: The Making and Unmaking of Militant Unionism, 1900-1950, this book shows that communists made decisive contributions to unions at the local level. Feurer also shows, like Meyer, how local communists often paid an enormous personal price for their political beliefs. In the case of the UE in St. Louis, the communists were led by William Sentner. Sentner frequently found himself under siege by employers, rank and file union members, and national union leaders. His own beliefs, like those of so many American communists, were challenged by the Molotov-Ribbentrop Pact and the revelation of the brutal nature of Stalinism. He and other communists in UE District 8 operated fairly openly in their early years with the union, but their activities were circumscribed in the post-war years due to the anti-communists fervour that gripped the United States. Electrical industry companies are the employers discussed in this book. Components manufacturers like Emerson are often seen as ancillaries to larger industries like steel and auto, but we see here that they played an important role in local economies. The electrical companies in St. Louis were locally owned operations that practiced employer paternalism while simultaneously doing everything possible to oppose unionization. Like the meat packing employers described by Liz Cohen in Making A New Deal: Industrial Workers in Chicago, 1919-1939, St. Louis’ industrial capitalists sought to maintain full control of their plants but found their efforts thwarted by the economic cataclysm of 1929 and the determined efforts of their employees to exert some control over their working lives. Like virtually all employers in the 1930s and 1940s, those who opposed UE District 8 sought the support of local authorities—including armed force—to coerce striking workers. UE District 8 enjoyed considerable success with organizing and with promoting a vision of civic unionism among its members. Sentner was aware of rank and file concerns about his political views, but he also knew that communists were viewed with suspicion more because of the supposed influence of the Soviet Union on American communist ideology than because of how communism was interpreted by him and others in St. Louis. Communists promoted the unionization of women and African-Americans, and agitated for public relief during the Depression. The civic model failed, however, when the union attempted to form a broader social coalition to promote major government investment in Missouri. The success of the Tennessee Valley Authority emboldened UE District 8 to agitate for the creation of a Missouri Valley Authority that would finance the construction of a range of public works projects. The UE allied with groups like the National Association for the Advancement of Colored People to promote the MVA’s creation. Feurer persuasively argues that this civic model of unionism that was exemplified by the effort to create the MVA failed due to employer efforts to reassert control during the post-war years. This observation is significant as it illustrates that American unions attempted to pursue a version of unionism in the postwar years that transcended the work place, but were stymied more by employer opposition than because of apathy within the labour movement. This book is primarily about the years from the early 1930s to the early 1950s, so a title that reflects this emphasis would have perhaps been more appropriate. This slight shortcoming does not in any way diminish the strengths that this book possesses. In an analysis that incorporates gender, race, politics, economics, and biography Feurer has made an enormous contribution to our understanding of how the American labour movement developed from the 1930s to the 1950s. Somehow I never noticed this before. Thanks for posting it Juan, it's a good review. This observation is significant as it illustrates that American unions attempted to pursue a version of unionism in the postwar years that transcended the work place, but were stymied more by employer opposition than because of apathy within the labour movement. Radical unionism in the US has always sought to organize beyond just the walls of the factory. It's been the most conservative wings of the labor movement that have argued for limiting the scope of the union to pure workplace organizing. This is particularly important in the South, where the CIO could have chosen to incorporate anti-racism and civil rights into the post-WW2 "Operation Dixie", but instead chose to limit itself to pure workplace demands as it tacked to the right under the pressure of the anti-communist purges. The result was a total failure: the South was solidified as "non-Union", providing the model that the rest of the country is now following; and the labor movement would remain cozy with racism for decades. As some in the IWW react negatively to the growth of the GDC and the Community Self-Defense model pioneered by the Twin Cities local, and say that we should limit ourselves to pure workplace organizing, they end up sounding eerily similar to the Teamster bureaucrats who panicked at the growth of the Minneapolis local in 1934. Well there's also a big difference between the CIO in the 1940s, an organization of millions with some of the largest victories in working class history, at massive, economically vital industries...and the IWW in 2017, an organization of a few thousand that has difficulty in even winning organizing campaigns targeting tiny shops. The IWW is making no decisions that will be as important as the largest unions in the postwar era. Yes, I agree with that. I think there's a huge problem of perspective in the IWW. The IWW today isn't even making any decisions that will be as important as the decisions made by the IWW in the post-WW2 era, which was already tiny compared to any of the CIO unions but massive compared to us. But the decisions it makes (or refuses to make) do have some importance. The reason I mentioned the CIO is that it is important to talk about the history of ideas in the labor movement since we do, to some degree, measure ourselves against "business unionism," although that is very nebulously defined. Some members hold up this idea that a "pure" syndicalism focused exclusively on point-of-production issues is "radical" compared to traditional business unionism, but at least in the US context, that is what traditional business unionism has always focused on. For comparison at scale, the contemporary IWW now is probably more comparable to the Trotskyists at the start of the 1930s - small, but conceivably able to intervene in ways that will have big impacts. The question is whether we will be able to. Teamsters Local 574 only had 75 members before the 1934 strikes in Minneapolis, and only a handful were Trotskyists, but they were able to have a huge impact that led to growth and changed the shape of things across the country. The Teamsters bureaucracy meanwhile panicked about having the wrong kind of growth, and charged that Local 574 was breaking the union's Constitution by calling unauthorized strikes and signing up the wrong kinds of members - which, of course, they were. I am not sure how there can be any comparisons. But I am not a Wobbly and apparently am not privy to the inner working and struggles of the IWW. Wobblies as Trotskyists seems/sounds funny, mostly. I disagree. The complete lack of an organizing policy and the complete lack of any effort to marshall organization wide resources toward a strategic organizing policy is the main fault of the contemporary I.W.W. Skepticism about dilettante "anti-fascist" activism is not the main impediment to growth. Refusal to learn hard lessons about the complete unsustainability of "radical Unionism" taken to mean direct or solidarity Unionism is a contributing factor here, which has led to casting about for some other form of recruitment. Even if GDC activity was leading to thousands of recruits it wouldn't change the fact that the i.w.w has no plan on what to do with them, no working model, and no strategy for growth. are also those who have been resistant to planning for growth, or finding ways to consolidate the growth we've seen since the election. However the biggest problem with your implications is that they are empirically wrong. Growth happens in part through inspiration and excitement, and those things are infectious, they don't just remain in one narrow box of "pure workplace organizing" (nor, for that matter, does excitement about community self-defense draw energy away from workplace organizing). Just one year ago there was no organized IWW presence in North Carolina. Now we have organized groups in 4 cities. At least three of those groups are organizing actively in multiple workplaces. One of them is now the largest IWW group south of the Mason-Dixon line. A lot of this energy came from excitement around the community self-defense model. I'll take actual growth as a starting point over a theoretical "strategy for growth" any day. Frankly, I'm a bit immune to this stuff now. I've seen what comes of wobbly promises of "organizing", of workplace campaigns, etc. Very little of it departs from the sbux/jjwu paradigm, and when it does and is successful, it is either derided or ignored. That's a severe problem. Instead of addressing it, some Wobblies are playing jr. Partners to the liberal media's drum up of a "mounting fascist threat", presumably to attain growth. If I "go fishing" it doesn't matter how many buddies I bring if none of us have a pole in the water. I understand that it is exciting that more people are joining the union. But we aren't solving the fundamental problems. Many people, especially those most sympathetic to the projects of the GDC, are suggesting we move in directions that would hurt concentration of resources and coordinated organizing campaigns. We don't have a working model for workplace organizing. Suggesting that we (a union) focus on that is not the same as saying that we drop the gdc stuff whole cloth; though I wouldn't mind it. What's good in the gdc could be incorporated in the broader union. But that's besides the point. The fact that we have to discuss why the workplace is the center of struggle under capitalism, in the I.W.W. of all places, is already fairly revealing. It's a good thing we have well formed cadre who can figure this stuff out for us. What I'm arguing is that what we have is essentially free floating cadre. There is no guiding policy and no collective mechanism for making their failures accountable and learnable. There is no method to come together, agree on an organizing strategy, and execute it. Instead, we tell people that a handful of volunteers could possibly take on Starbucks, mcdonalds, etc. I ask this without prejudice or ill intent, why the use of the term "cadre". I don't like the term cadre. I don't think I completely agree with that style of organizing. But I sort of used it because it was flung at me. I would say that workplace committees and cadre are virtually indistinguishable in immediate form, though they relate to different organizations. The idea in the I.W.W. is to form workplace committees. This is of course the basis of any legitimate, member run union, especially one based on class struggle principles. My qualm is that building committees, while necessary, isn't sufficient to build lasting union institutions that make gains for members and educate broadly about the class struggle. This is pretty evident from a cursory look at the history of the labor movement anywhere, or even just the United States I feel. The irony of the cadre term is that the current I.W.W. policy *is* defacto a loose cadre form; the closest thing the I.W.W. has to a collectively determined organizing policy is to just do a bunch of ot-101s. The result is that individuals who attend learn how to form workplace cadres or committees and start taking direct actions. The problem is that the wider union has no wider strategy for how to deploy these committees in an effective way, how to gain beachheads in industries, and how to defend these committees when the anti-union campaign begins. This is because I.W.W. strategy is broadly based on Solidarity Unionism (with some modifications) itself inspired by Lynd who in turn was inspired by Weir and Glaberman, both of who were members of Socialist parties pursuing the formation of workplace cadres/committees to push their unions to the left or defend immediate workers interests, *in the context of already unionized workplaces*. I actually have a lot of agreement with the critique you are raising of our current (lack of) industrial strategy and the way that it defaults to "Do a bunch of Organizer Trainings, tell people to salt somewhere, and hope for the best." I've actually written a lot to try to get us beyond that. I'm not sure what that has to do with community self-defense. Maybe we should move the discussion to a forum, since it's a bit off topic? My main problem is that I don't think the increase in membership will translate to an increase in our effectiveness in anyway without a prior change in strategy and our technique of organization. I don't have much faith that community self defense detached from a viable industrial organizing strategy can really happen/exist because the political basis to challenge the capitalist state and organized right wingers (Where they matter) is militant unionization of the working class. This is true because the working class isn't spontaneously aware of it's own interests, nor organized into a discrete community. The process of union organization plays a key role in educating workers about their both immediate and long run interests. It helps clarify their condition as a class *at all* which otherwise is often obscured. It also organizes them where they can have incredible impact; at work. Put tersely, without unionization, you don't *have a working class community to defend*. Unions, especially member-run, socialist unions, are the primordial constitution of working class political and social independence - *community* - as opposed to the capitalist/politician controlled and organized geographical locations where many workers might happen to live side by side. These areas can be used for organizing political parties I think, but their basis of success I Think often depends on those workers being somewhat class conscious; a process which can best be instigated and effected through union organizing. Put tersely, without unionization, you don't *have a working class community to defend*. Thanks for distilling white workerism down to one sentence. Good to see the deeply pro-capitalist logic of the right wing of the Democratic party has seeped into the 'anarchist' left. I doubt you would suggest that rather than joining unions which yield higher pay, paid time off, and insurance for their families, (nevermind rights on the job) non-white workers ought to ingratiate themselves to self-help snake-oil salespersons, poor-dad/rich dad schemes, or turn to some ghosts whether biblical, nationalist, entrepreneurial, or what have you, that keep them under the firm thumb of the employing class. 11.2% of white workers are represented by unions. 14.5% of black workers are represented by unions. Tell me again how unionization is the automatic purview and benefit of 'white workerism'. If the right wing of the democratic party is promoting community self-defense alongside militant unionism, that is news to me. I imagine I'm not the only one. What does the left-wing of the DP stand for? I do love that you have to resort to a pretty pathetic strawman. Yes, those who promote community self-defense alongside militant unionism are actually secretly against any kind of unionism. You've discovered our darkest secret! Your 'colorblind' workerism that focuses only on point of production organizing and point of production issues is about as useful as 'colorblind' feminism. To say that without unions, there is no working class community to defend is probably some of the most reactionary stuff that I've seen on Libcom in awhile. That's to the right even of most Trotskyist economist groups. It's disappointing from someone who is part of a specific communist organization. How the hell would you explain something like the Ferguson rebellion, or the more recent reactions to police brutality? I have some writings on it that we're posted here and on our blog. So see for yourself. I didn't say those things are mutually exclusive. I suggested that our organization is subject to considerable resource constraints and some unclear priorities and suggested an alternative set of priorities. You called a focusing on organizing workers at work "white workerism". That's a false and commonly used liberal narrative that seeks to undermine union efforts. By and large, especially with respect to the I.w.w., union efforts have had to come to terms with integration and equality between races well before wider society and politics made adjustments. I know we're both familiar with the historical detail. The problem is that "working class community" is being used by you as a stand in for "non-whites". Again, as Clinton's failure shows, the white working class matters, because the *working class matters*. Promoting the unity (across divisions of race ethinicity religion gender) of the working class is not colorblind politics or class reductionist. The concrete tasks at hand in building material cooperation between groups of workers must be confronted to wage successful union organizing drives. It's simply a fact. As far as a political approach to the special forms of oppression, there are unique problems that confront black workers or women workers, which are solved by the equal attainment of programmatic demands that benefit *all workers*. For example, disarming the police or reducing the number of armed officers woul reduce the likelihood of extrajudicial killings. This would benefit all workers who are subject to policing but especially black workers who we know to be more likely to be shot by cops. This is not a class reductionist argument but merely a class one. And it's exactly the type of argument that Clinton sought to undermine when it came to Sanders own proposals of policies that would benefit working class people in the U.S. (single payer for example) but also by doing benefit the doubly marginalized on race and class grounds. There are some changes (integrating schools) which would possibly lead to white PB and bourgeois stoking working class white fears. It's our job to combat that, not play into it by asserting (fallaciously) that black and white workers have conflicting interests. As far as a political approach to the special forms of oppression, there are unique problems that confront black workers or women workers, which are solved by the equal attainment of programmatic demands that benefit *all workers*.